There are a variety of things you can do when you visit us at Dirst Canoe Rental & Log Cabins. The most popular thing is, of course, floating down the river with a group of friends in a canoe or raft. However, there are some other forms of traveling down the river that you may also enjoy. Take peek at some other activities you may want to try out on your next trip to Dirst Canoe Rental & Log Cabins. The Buffalo National River is known as one of the best places for dropping a line. In fact, anglers travel from all over each year to see what all the hype is about. So what makes fishing on the Buffalo River so great? There are a number of things, but for fishermen, this clear waterway is home to a variety of fish including bass, perch, and catfish. The biggest attraction to this section of the Buffalo River is the smallmouth bass. Canoe fishing is also a very popular pastime in this area. When getting your gear together, you will want to make sure that you have an up to date Arkansas Fishing License. You can purchase the license online by visiting the Arkansas Game & Fish Commission website. Bring your gear, your license, a snack, something to drink, and we will provide the canoe. At Dirst Canoe Rentals, we offer more than just canoes for your floating adventures. Some people prefer taking out a kayak over a canoe. Each watercraft has their pros and cons. Both offer a different experience. If you have questions about which one should take out, feel free to ask. And just in case you already own your kayak, we offer shuttle service for a small fee. If canoes and kayaks are still a bit too much for you, then you should try our tubes. Just sit down, relax, and let the river take you for a ride. If you are in charge of hosting or planning a big event like a family reunion, then Dirst Canoe is the perfect place. 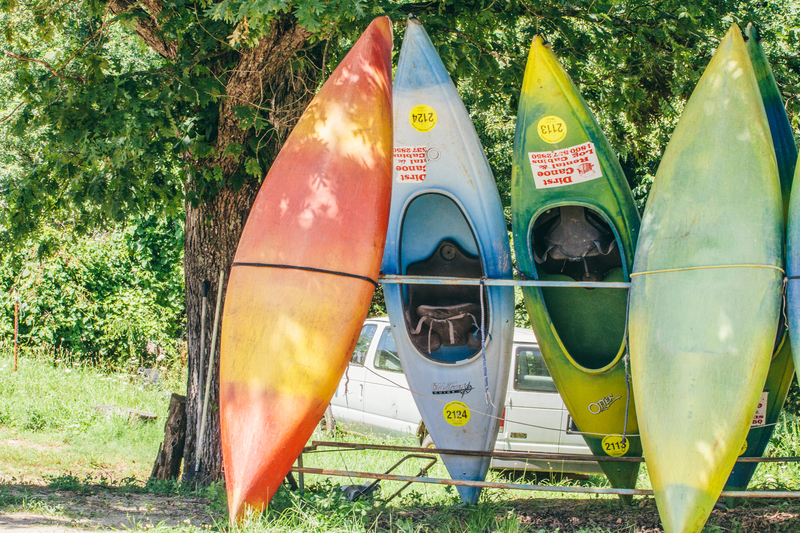 With so many different activities you can do along the Buffalo River, hosting a big event such as a family reunion, a business retreat, or a wedding at Dirst Canoe Rental & Log Cabins is sure to be a crowd-pleaser. We are also experienced with larger groups and help you plan your event. Fishing, canoeing, and kayaking while spending time with family and friends is what sweet memories are made from each year at Dirst Canoe. For several years, we have enjoyed watching families come back year after year with their loved ones and close friends to enjoy the beautiful and majestic waterway known as the Buffalo National River. Whether you just want a few hours of relaxation or a weekend full of fun, give us a call at 800-537-2850 or 870-449-6636 to get your adventure on the books.